Conserving energy and protecting the environment starts at home in your new Pepper Viner High Performance-High Design Home. Energy efficient green home building practices are standard on all new homes built by Pepper Viner. The mechanical system in each Pepper Viner Home is designed by Energy Star Version III recommended software which takes into account the entire home design. The result is a properly sized green home system. House wrap – engineered for superior performance is a revolutionary product that limits air coming into the home through the wall but still allows moisture to escape. Self-adhered window wrap flashing on every window helps prevent mold growth and improves energy efficiency. The truss system is designed to handle solar energy panels and to coordinate with all ductwork and insulation to ensure proper functioning. A fresh air intake built into the HVAC system produces better indoor air quality. House wrap – engineered for superior performance is a revolutionary product that limits air coming into the home through the wall but still allows moisture to escape. Self-adhered window wrap flashing on every window helps prevent mold growth and improves energy efficiency. The truss system is designed to handle solar energy panels and to coordinate with all ductwork and insulation to ensure proper functioning. A fresh air intake built into the HVAC system produces better indoor air quality. An unvented roof system with insulation to the roof deck becomes a sealed envelope all the way up to the trusses. All ductwork stays within the insulated areas of the home so your heating and air conditioning unit work more efficiently. Each home includes Insulation of R-19 in the walls and open cell spray foam in the ceiling. Third party testing at 3 different stages of construction ensures framing, insulation, and HVAC systems function as a whole. You receive a certified Home Energy Rating System rating. Recyclable carpet is used with a low VOC carpet pad. Low VOC interior paint is used, and Zero VOC paint is available. The home is prepared for future solar photovoltaic systems. Home Energy Rating System (HERS): A home energy rating is an analysis of a home’s energy efficiency. The HERS Index MEASURES A HOME’S ENERGY EFFICIENCY and there are a lot of great reasons to have a home energy rating performed on your house. It can tell you so much about the home you live in, like how efficiently it’s operating and where you can make modifications for greater energy savings. When you’re selling your home, a low HERS Index Score can command a higher resale price. And when you’re buying a home you can anticipate the costs of energy bills and efficiency upgrades. 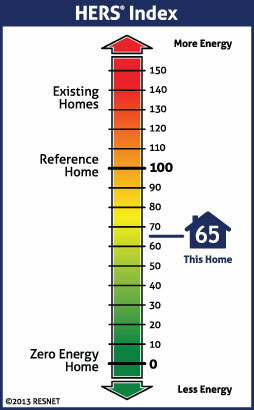 To calculate a home’s HERS Index Score, a certified RESNET HERS Rater does an energy rating on your home and compares the data against a ‘reference home’– a designed-model home of the same size and shape as the actual home, so your score is always relative to the size, shape, and type of house you live in. Heater and air conditioner work more efficiently so that the temperature of the home is consistent and even throughout the home. Homeowners will receive documentation that their Pepper Viner home meets the Energy Star and EPAct standards. Pride in doing your part to protect our beautiful Sonoran Desert by using less energy – 75% of all energy use is attributed to the buildings where we live and work.